Last week I got chatting to Étienne Ghys, a wonderful French mathematician who was in Edinburgh showing us his new films about Chaos. We told him about Botanica Mathematica and he said “You could knit a Fibonacci tree!”. And I thought, “Why haven’t we already knitted a Fibonacci tree? ?” The idea was so obvious and its execution so easy that it seemed silly not to have done so already. The Fibonacci pattern is also an excellent model for how plants actually grow, so it was perfect for the Botanica Mathematica project. The black numbers to the right indicate how many branches there are at each time step. 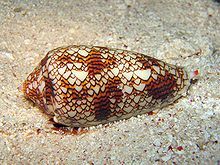 This sequence of numbers is known as the Fibonacci sequence, and the next number is the sum of the previous two. The small blue numbers next to each branch indicate how wide the branch is – in knitting terms this is the number of stitches you are knitting with (in the round) for that branch. 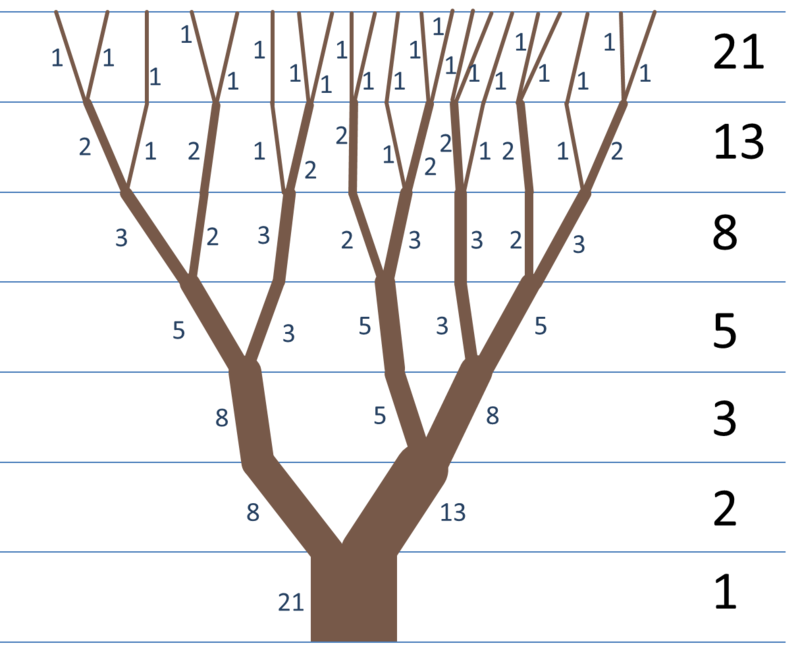 There’s Fibonacci numbers everywhere in this tree: in the number of rows you do at each stage; in the size of each branch; and in the number of branches at each horizontal cross-section. The ratio of successive Fibonacci numbers gives (an approximation to) the golden ratio, and indeed the finished tree has a pleasing dimension and appearance to it. I think it looks more realistic than the binary bonsais. Do you like it? Do you have more ideas of what we could make, or ideas of how to adapt the Fibonacci tree? Let us know! 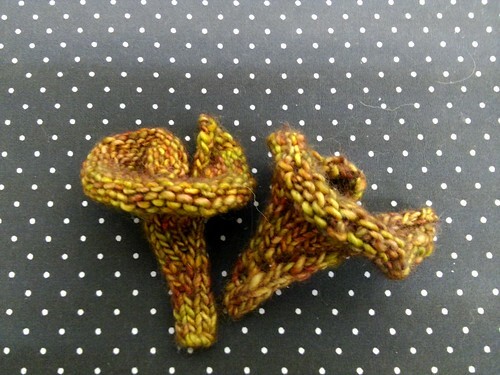 knitted chanterelles, a photo by MadeleineS on Flickr. Whoops! this picture was originally posted without any text – sorry. I was testing a new uploading app for Flikr and hadn’t realised it had appeared on the blog too. Anyway these cute little knits are a couple of hyperbolic chanterelle mushrooms that I knitted up using different increase methods. The knit front and back method is definitely more realistic but the holes from the yarn over technique create interesting patterns of their own. So how do you make one? These are knitted in slightly heavy double-knitting weight yarn on 4.5mm circular needles but you can make them bigger or smaller by choosing different yarn and needles. Cast on 6 stitches and work a short i-cord stalk (6 rows or so). Now increase every fourth stitch till you get 8 stitches. After that it’s a bit too big to work as i-cord so work flat stocking stitch instead but slow down the increase rate. On the plain rows increase every fourth stitch. On the purl rows don’t increase at all. 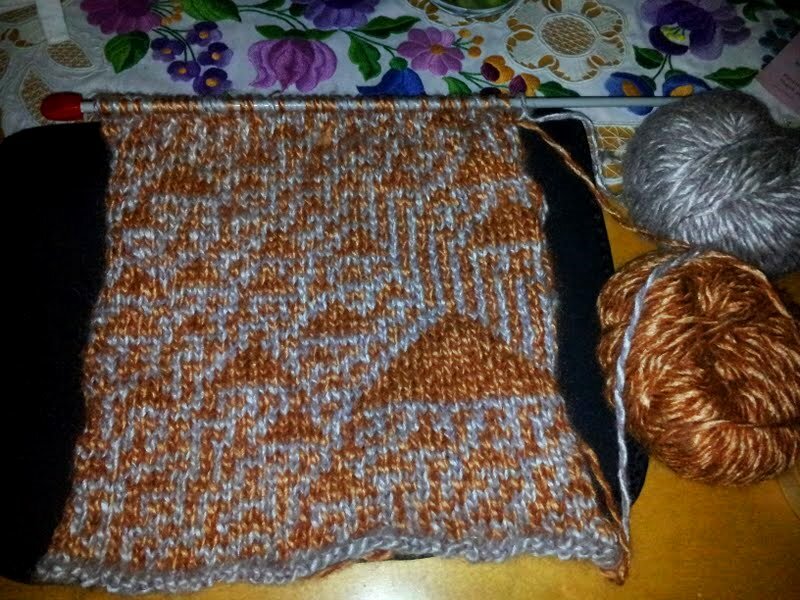 After about 20 rows cast off and you should have something that looks like one of the mushrooms in the photo. Have a go! Have fun with it and let us know how you get on. Categories: patterns and instructions | Tags: hyperbolic, knitting | Permalink. simple binary tree in Misty Alpaca chunky yarn on 6.5mm dpns. 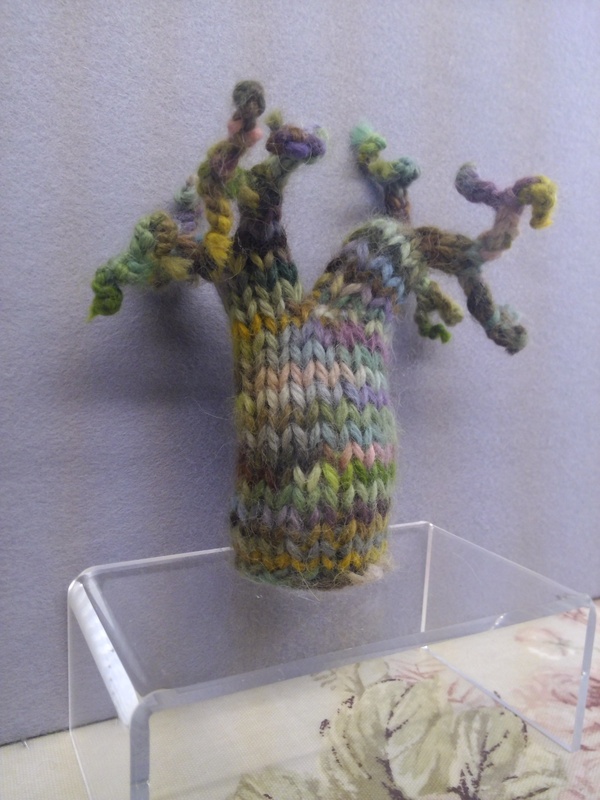 These little trees are knitted in the round and repeatedly divided in two to form branches and twigs. They could also be crocheted but I haven’t tried it yet so I’ll talk in terms of knitting. Once I get time to try it I’ll write it up. In the meantime have a go yourself once you get the idea of the knitting. The choice of yarn and needles is up to you. Browns and greens are best for colour. Thickness of wool and size of needles can vary but it’s best to work to a slightly tighter tension so the stuffing doesn’t show through. I’ve used a set of five double pointed needles in my test pieces but you could use circular needles and the magic loop technique. Spare dpns are handy as stitch holders towards the end and when you’re making i-cord branches. In order to be successful with all these divisions you need to start with a power of two stitches. Not just a multiple of two – every time you divide your stitches in two each part must also be divisible by two. So you need numbers like 4 (2×2) or 8 (2x2x2) or 16 (2x2x2x2) or 32 (2x2x2x2x2) and so on. The first couple of these will give you a very small structures without much branching so I’d recommend starting with 16, 32 or 64 stitches, depending on the yarn and needles chosen. Once you’ve decided how many to start with cast them on, join in a circle, place a marker at the start of the round and knit the trunk of your tree. Trees come in many shapes and sizes so you can make it short and squat or longer and thin. For your first tree I’d knit as many rounds as you have stitches cast on. Now place half the stitches on a holder and knit rounds with the rest. Your first branch is under way. As many rounds as you have stitches and then split again. Keep doing this until you run out of stitches. Cast off and break the yarn. Rejoin the yarn at the smallest split pick up the stitches and work to the end. Then go back and to the next smallest split and work to the end splitting as you go. Eventually you’ll work back to the first split in the trunk and so you pick up the stitches and work the same branching structure at this side of the trunk. Once you’ve run out of stitches to pick up and all the branches have tapered off then stuff the tree with toy stuffing. 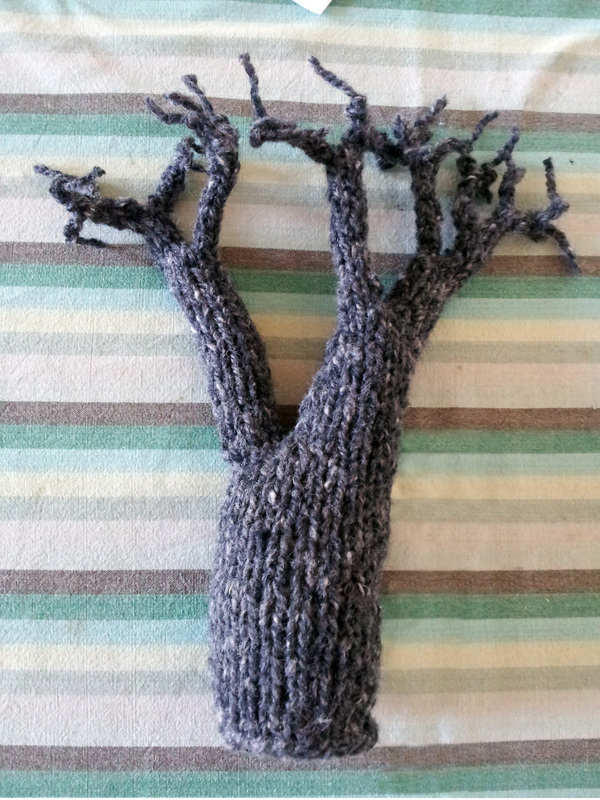 Gently push the stuffing into the branches and the floppy tree skin you knitted should start to support itself. When you are a happy that the tree is well stuffed stitch a piece of felt across the bottom of the trunk or pick up stitches round the hem and knit a base – if you want you could even knit a few big roots to make it more realistic. Cast on 16 stitches, join in a circle, place marker. Place 8 stitches on holder. Knit 8 rounds on remaining 8 stitches. Place 4 stitches on another holder. Knit 4 rounds on remaining 4 stitches. Place 2 stitches on another holder. Knit 2 rounds on remaining 2 stitches. Cast off and cut yarn. Pick up 2 stitches from line 7, rejoin yarn and work lines 8 and 9. Pick up 4 stitches from line 5, rejoin yarn and work lines 6 to 10. Pick up 8 stitches from line 3, rejoin yarn and work lines 4 to 11. Tuck all the ends of yarn inside the tree. if there are any odd gaps stitch them closed with some spare yarn. Stuff tree with toy stuffing. Close the base of the trunk with knitting or by stitching a circle of felt in place. Categories: patterns and instructions | Tags: binary, knitting, patterns, tree | Permalink.